The name Pat Rousseau is almost synonymous with Myers, Fletcher & Gordon. Pat has literally seen the firm of attorneys grow from its infancy to where it is today. By striking up a conversation with Pat, you will readily discover that he is a commanding speaker with a distinct lisp who seamlessly captures the attention of his audience with his every word. PAT: I came here (Myers, Fletcher & Gordon) January 2, 1960 after having done 3 years at Kaiser Bauxite. I was offered a job at Kaiser and the money I was offered was slightly more than double what my old law firm was offering and the decision at that time to go to Kaiser bauxite was a no-brainer. Pat told me that it was during his tenure at Kaiser Bauxite that he learned management. He said bauxite was a new industry with a lot of firsts and that allowed him to get first-hand experience in management. He also told me that a friend, Bill Rhodes of Citi Bank recommended that he participate in a summer course in financial management at Harvard University and he said that course helped to make him a better manager. PAT: ‘I find there is a tendency to do only law in further studies. I preferred to do management. I was the lead managing person in the firm when Douglas (Fletcher) was appointed as a member of the government’s cabinet. I took on the firm’s management under his supervision. I was about 28 years old at that time. I journeyed with Pat down memory lane and he explained that Myers, Fletcher & Gordon was originally on Duke Street before moving to East Street in the early 1970s. He said the firm was able to grow through commitment and by implementing better business practices in a strong economy with a lot of new ventures. PAT: In the 1960s the firm grew from about 7 to about 30 attorneys mainly on the back of a housing and commercial practice. The firm had a very good culture, that’s what kept it strong. (There were) great levels of loyalty among the partners. The partners and associates had excellent personal relationships. I think it allowed the associates to learn quicker. Frank Myers was a scholar and was super bright. When it came on to drafting documents, Frank Myers was a master. He had total recall. All the real estate forms we use now are still 80% the work of Frank Myers. Douglas Fletcher was known as the Prince of the Resident Magistrate’s Court because he was such a good lawyer and was very popular with his fellow practitioners. If ever you had a case with Douglas Fletcher and it was a close one, you are likely to be edged out by Douglas due to his charm and charisma. To illustrate the kind of mind Frank Myers had, Pat told me of a situation he witnessed one afternoon at lunch with Douglas Fletcher & Frank Myers at Kingston Club. He said there was a high table that he would not normally have been welcomed to sit at because he was a young boy. He said the high table included Robert ‘Bob’ Lightbourne, Earl Maynaird, Allan Delgado, Douglas Fletcher & Frankie Myers, all distinguished professionals. He said on one of these lunch trips Robert Lightbourne, who always loved to do these things, said he would give £5.00 to the man who could name all the men who served as president of the United States of America. After several tried and failed and Bob Lightbourne was about to pocket his money, Frank Myers asked if he could participate, Bob allowed him and he named all the presidents in the order in which they took office. He said that was a testament to the mind Frank Myers had. We went back to Pat’s days of high school & law school. Pat told me that he attended Wolmer’s Boys School and that initially he was up and down with academics. PAT: They put me in the same form as my older brother. He was the sports star and my hero. My work fell off when I spent the same year in school with my brother but then it picked back up. Then I went and studied law and passed all my exams first time. It was a lot of work. The year I took the bar exams there were 10 of us and only two of us passed, George Fatta and myself. Pat told me that he got a lot of exposure by writing to the newspaper and attending public meetings. He said he got involved in the debate on many social issues. He, however, warned that one should confine oneself to issues where you either have or can get access to the facts before sticking your head out on a limb. Pat told me that he used to read a lot. He averaged 30 to 40 books a year in some years. He said his friend, Alister McIntyre, a Grenadian born Professor, and former Vice Chancellor, of the University of the West Indies introduced him to speed reading after he observed the incredible speed at which Alister read. He bought a book on the subject and taught himself the key elements and practiced a lot. He said McIntyre had total recall and could finish a book in 40 minutes. Pat Rousseau was appointed to the rank of member of the Order of Jamaica for the work he did for the Government of Jamaica in relation to the bauxite negotiations in the 1970s. The Order of Jamaica is an honour that is conferred upon a Jamaican citizen of outstanding distinction in a particular field. PAT: I thought I was blessed because I was very young. Usually it is given to star athletes and leaders in industries for decades. It was done in 1976 and is the equivalent of knighthood. I was very flattered. Douglas Fletcher was a member of the Order before me and subsequent MFG partners, Alfred Rattray and Dorothy Pine-McLarty have been similarly honoured. 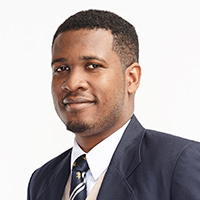 Jahmar Clarke is an associate at Myers, Fletcher & Gordon and is a member of the firm's Litigation Department.Jahmar may be contacted via jahmar.clarke@mfg.com.jm. This article is for general information purposes only and does not constitute legal advice.